It’s for me! Hard to believe that the feast of Books & Culture* enters 15 years of production. The new issue has a time line on the cover and an accompanying podcast which I commend to you. Do you read Books & Culture? Yes/No, skim table of contents (or available on-line materials) and choose by author. Yes/No, skim table of contents (or available on-line materials) and choose by topic. Yes/No, skim table of contents (or available on-line materials) and choose by author and/or topic. Whether or not you regularly follow Books & Culture, please click on Read the rest of this entry » to take a poll on which of the articles in the September/October 2010 sparks the greatest interest in reading, possibly discussing. Also free to comment on what you do/do not find of interest in with regard to Books & Culture and articles from the current issue. Any article(s) “worth” discussion on the ESN blog or other periodicals (web or printed) by Christian Scholars which we members should be sure to “follow/read? *Books & Culture, has extended to all ESN members an offer for new subscriptions at only $5 a year. 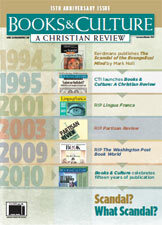 Also available: a 75% discount on electronic access to the Christianity Today Archives. Members: see our Subscription Discounts info for ordering details.